The mains attraction along the Yangtze is its views. 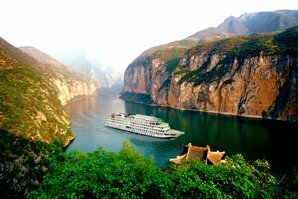 Whether you are hiking in Tiger Leaping Gorge, on a cruise ship in the Three Gorges, or visiting one of the sights on its banks — you&apos;ll find the Yangtze has carved a striking path through the landscape of China. 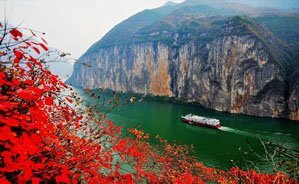 As you follow the course of the Yangtze downstream down this page, you&apos;ll see that Chinese culture and ingenuity on this great river&apos;s banks adds many more attractions. 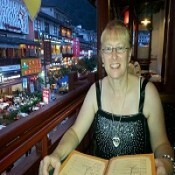 Lynne Buddin is a three-time visitor to China and customer of China Highlights. 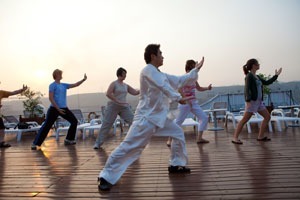 Here she introduces a top range of Yangtze attractions from first-hand experience. The "First Bend of the Yangtze"
Stone Drum Town is a pretty market town at the photogenic "first bend" of the Yangtze with a colourful pagoda and statues depicting the hard work of everyone in the War, a sailor/fisherman joining hands and supporting a soldier in uniform against the background of the mountain ranges. 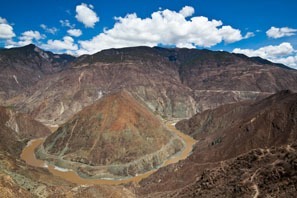 The legend of Tiger Leaping Gorge is hard to believe as you stand and imagine the tiger leaping the Yangtze River. The force of the water at the narrowest point of one of the deepest gorges in the world, as it catapults its way through, just has to be heard to be understood. If you have only just seen the First Bend of The Yangtze River earlier, the difference between the tranquil water there is a shock. There is nothing quite as relaxing as sitting in a comfy chair with a cuppa watching ever-changing scenery through a picture window. Take a pack of cards, the latest thriller, your knitting: whatever “floats your boat", but be prepared to bring it back untouched, as there was just too much to see and do. Don’t pass up on the onboard “lectures”. You could learn to speak some basic Mandarin, tai chi, mah-jong, learn about reflexology, or watch a display of snuff bottle painting. The best lecture for me was called “Ancient Waters, the Timeless Yangtze” which included sepia slides of men called &apos;trackers&apos;, who, almost naked, literally pulled the ships back upstream by ropes in the days before engines. On board shows are great. Surprisingly you will know some of the stars. Grab yourself a drink at the bar and relax as the crew treat you to their shortened version of Chinese history, including classic music and elaborate costumes. One unlisted attraction is the genuine Chinese life you will see all along the river. It can be totally fascinating to see a different countries culture. Watch out for fish or pig pieces being hung out to dry in the open air. You may also see fisherman quickly “hitch a ride” by tying his small boat to the ship to sell his fish, which has to be very risky! At any dockside you will see giant vats of noodles prepared for travellers on the ship who are self catering. As the ship’s horn warns of embarkation this becomes a frantic last minute grab. Sellers use long nets to collect money and return packaged meals, when that’s no longer possible a skilled throw puts meals on board. 3. Fengdu Ghost City — Are you worthy of the afterlife? 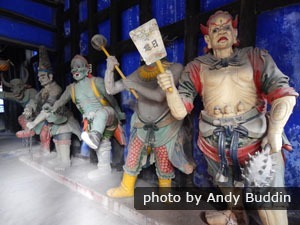 Fengdu or the “Ghost City” has many statues and figurines to ponder. Join in with the culture lesson from the guides and you can find out in a series of tests whether you can deserve to pass into heaven. See the depictions of punishments given out to those who fail. All done in a light-hearted manner. If you manage the bridge and the numerous stairs it’s well worth the trip to view the Shibaozai Pagoda, Pavilion and Temple. Before the construction of the Pavilion in 1819, people were hoisted up the mountain by a system of chains. If the hill’s too much for you sedan chairs can be hired. 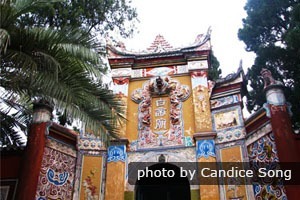 Outside the Taoist Temple you can hear Monk’s tales of the “Duck Well” and the “Rice Flowing Well”. Embedded in the walls are ancient Chinese engravings from famous people throughout history, other poet’s work and great leader’s quotes. The engravings show a history of the Chinese written word and how much it has developed. The contrast between this and any city’s simplified Neon lettering is vast. Our highlight was seeing Chairman Mao’s actual handwriting. Although Mao’s writing looked somehow shaky or squiggly we were very interested that in England we’re taught he was an illiterate farmer, and this slab disproved that. The pretty bamboo “sea” is actually a field of many different types of bamboo dotted with animal sculptures. It “waves” gently in the breeze. This place has beautiful coin carvings in the rocks and several pretty bridges. There’re many lovely spots for photos, but it was a lot of walking. It’s a relocation village, one of 13 displaced by the Dam. Villagers chose whether to go down river or up, so chose fields, or by the sea. If the decision wasn’t unanimous, a vote was taken. In this area they now grow oranges or tea, or live on tourism. 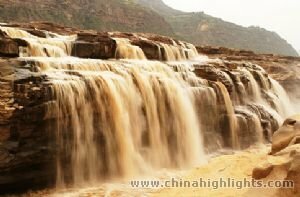 Leelee the specialist guide says Goddess Stream is “the most primitive and narrowest tributary of the Yangtze’s Three Gorges. It’s totally natural with abundant plants and animals”. 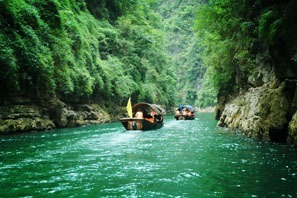 You take smaller river boats because of it’s narrow parts, but you wouldn’t want to fall in as it’s 90m deep! The first mountain village you see cultivates a wild red tea, called Longevity Tea, containing zinc, it’s been tested to prove its anti cancer properties and digestion improvement. Villagers also benefit from the fresh air, high rainfall, (1,000 mm/year), and are fit enough for going up and down the mountain. There are 10 men more than 100 years old that live there. Red Tea anyone? In the mountains they grow corn, potatoes, sweet potatoes, sesame seeds, tea, oranges and tobacco. The farmers keep pigs and chickens and catch fish. 50% of Chinese medicines are grown here. Other animals you may see include ponies, boars, wild monkeys, and birds. Round holes high up the mountains are where stone "hanging" coffins were removed to prevent ransacking. Now preserved in museums, no one knows how they got in the mountain caves — there’s no walkway. It’s suggested they abseiled them from the top but that’s quite incredible, another thought is maybe the river reached much higher then, and coffins were floated there on rafts. You stop for photos of the scenery at the end. All the boat&apos;s guides will sing for you there, and while you might not understand a word, it is fitting that their beautiful voices climb the surrounding mountains, then disappear on the wind. The villagers further along plant a camphor tree on the birth of a child, then when they are married, they cut down the tree to make furniture. They also have “crying weddings” where the bride must cry for several days before her wedding or she is won’t be considered to love him enough. 8. The Three Gorges themsleves are a scenic attraction. The Three Gorges are: Qutang Gorge (on the reverse of a 10 yuan note), Wu Gorge, and Xiling Gorge, together known as the Three Gorges Scenic Area (AAAAA class, the highest in China) or “Nature’s Art Gallery”. Gorges form when hard rocks crash down into a river running over softer rock below, then swirls round causing erosion. This process is repeated and a waterfall forms, then retreats upstream causing a steep sided gorge. The Temple was relocated 3 km away up the valley side in 2006, in preparation for the Dam. Imagine that! Qu Yuan was a statesman and patriotic poet; the original temple was built in 820, to honour him in his birthplace. Several buildings inside the impressive gateway contain his tomb and a statue. Yes, 1.3 million people were relocated for the huge Dam, among them minority people whose very way of life could be lost forever. But, the risk of flooding is vastly decreased. Instead of every 10 years, it’s now believed to be only one in a hundred, in fact almost right after completion it had it’s first real test, as water reached previous flood levels and the barriers coped. 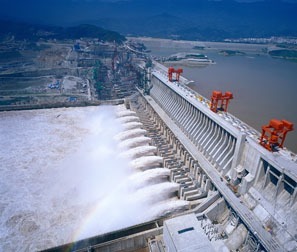 The huge amount of hydroelectric power produced is eco-friendly. The Dam is already a tourist attraction in it’s own right. 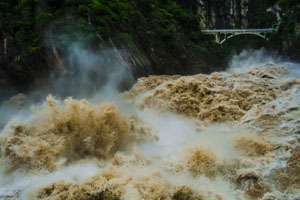 Although the land beside the Yangtze River is very fertile, it has and always will also be incredibly dangerous — you won’t see anyone swimming in the Yangtze — the current is just too strong! The Three Gorges Dam Project is a Wonder of the Modern World — the world&apos;s largest dam and hydro-electric plant in one, and a fine tribute to show what the Chinese Government and it’s people are capable of — harnessing the power of mother nature. 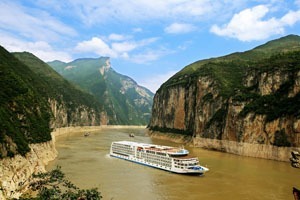 Our The Majestic Yangtze itinerary takes in Beijing, Xi&apos;an, Shanghai and the Yangtze in 11 days. Customize it to suit your needs. 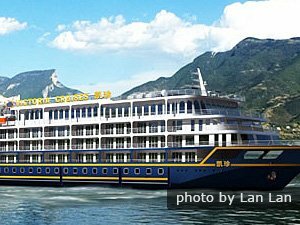 Contact us to incorporate the Yangtze River into a tailor made journey, or maybe start from these recommendations. 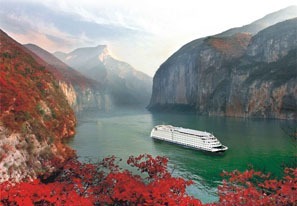 Victoria Cruises are our most chosen cruise option — the only American-run Yangtze cruise company. President Cruises have new luxury ships with larger rooms. 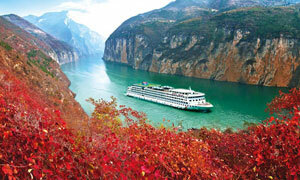 Yangtze Gold Cruises is the largest and most luxurious cruise series.